2015 was the year of Groff. President Obama called her novel Fates and Furies his favorite of the year. The New York Times named it a bestseller. Amazon.com bestowed its top annual pick upon it. Seth Meyers and Charlie Rose even sat down for interviews with her. But before all that, Lauren Groff wrote in the shadows. In 2008, after getting married, earning an MFA, turning thirty, and writing three unpublished novels, she saw her first glimmer of success: her debut novel, The Monsters of Templeton. In the years following she worked slowly. She wrote short stories and published another novel, Arcadia. But it’s her latest novel, Fates and Furies, that brought fame. A meditation on marriage and the impossibility of ever truly knowing someone, Fates and Furies struck a cultural nerve. Robin Black in The New York Times Sunday Book Review called it “a novel of extraordinary and genuine complexity,” and its strikingly inventive plot and evocative prose put it in rarefied company for contemporary fiction. Yet Lauren won’t revel in her success. She has three new projects she’s working on, not to mention the two sons she’s raising with her husband, Clay, in Gainesville, Florida, where she lives. Fates and Furies has turned her into a modern literary icon, but she maintains the slow and steady pace that brought her success in the first place. I spoke with Lauren about everything from artistic narcissism to Véra Nabokov to critic James Wood, as well as her winding road to success, the pressures of newfound literary fame, and what it feels like to have the President of the United States love your book. The last time we met you said you wanted to be a poet before deciding to become a novelist. Has your interest in poetry helped your fiction? I think reading poetry helps every fiction writer, and I think not just because of the insane devotion to the line that a poet has, but also because poets do so many formally inventive things. And my love of poetry came from being really, really excited by the form. My major influence in college was a formalist. He knew everything about mid-century British and American poetry. It was really exciting to see how the structure reflected and played against the material that was going on in the poem. Do you have an “aha” moment with your fiction where after twelve drafts you think, “Ah this is what the story is about” or “This is how this character should be”? Or do these things generally come to you quite early? No they never come to me early. I mean, other than short stories, which have a completely different process for me — I don’t even know how my short stories happen. But for novels, it’s waking up day after day, trying to figure it out and throwing my brain against it over and over again until one day I feel close to the material and the material starts to talk to me. I almost never feel like I know what I’m doing, which is actually a really exciting and wonderful feeling. What does that mean when you say the material “talks” to you? I initially try really, really hard to leave as much mystery as possible in the writing process as long as possible. So I don’t want to know what I’m doing. I want this to be messy. And so even when I think I have a really firm grasp of the character, I know for sure that that does not necessarily mean that I have a grasp of what the character has done in the past or will do in any given situation. I just, for years and years, play. I’m like a small child with Play-Doh sitting in front of me, and I’m just seeing what a character would do in a certain given situation. And Lorrie Moore (Lauren’s thesis advisor at Amherst) has this amazing thing where she sits down with an empty chair opposite her and invites her characters to sit down and start talking to her. And I think that that’s extraordinary and wonderful. But she’s a bona fide astonishing genius, you know? That’s her insane wonderful process. I couldn’t do that. It takes me a lot more time and thinking, a lot more living in the world of the book to start to understand what I’m doing. I was talking to Kazuo Ishiguro and I asked him if he starts with his setting or if he starts with his characters and he said “setting always comes at the end.” His characters and ideas come first. Where do you start? I think really, really visually. I mean that’s the way I respond to the world. I have to know what the place smells like and how the light comes in try to dream my way into the place in a sensory way first and then set the characters in that place. I really do think that place is extraordinarily important for fiction. Would you go so far as to say your mindset as a writer is almost that of a film director? I guess it’s just all off the top of the characters’ heads. I know that there are some directors that let the characters ad-lib, which is sort of what I’m doing; I’m figuring out where we are and then what happens afterwards. One theme that pops up in all of your novels is narcissism. What interests you about narcissism? I’m from people for whom narcissism would be the worst thing you could possibly have, and so I was hypersensitive to it for a very, very long time. My decision to become a creative person in the world seemed to be working against the grain of what I had always been taught — not to be the biggest narcissist on the planet. I don’t think we all are narcissists but I think there is a time in our lives when we all believe that everyone else around us is a robot and was created for us. And I see it in my little boys right now. And eventually most of us grow out of that phase, and it’s really interesting to see people for whom that phase has not ended in their adulthood. As an artist, isn’t it necessary to have a good deal of narcissism given that you’re effectively bossing around characters and creating a world? Maybe. I think it’s equally necessary to be aware of the way that the narcissism is rearing its head in your life, you know what I mean? You have to just be aware of what you’re giving up, I think, and how your actions are affecting other people too, and always try to strike the right balance between artistic self-enclosure and then being an actual human being in the world. Do you feel like you’re able to strike that balance? I struggle every single day. I think we all beat our heads against the whole idea of how to be creative in the world. I don’t think I strike the balance but I try really, really hard. 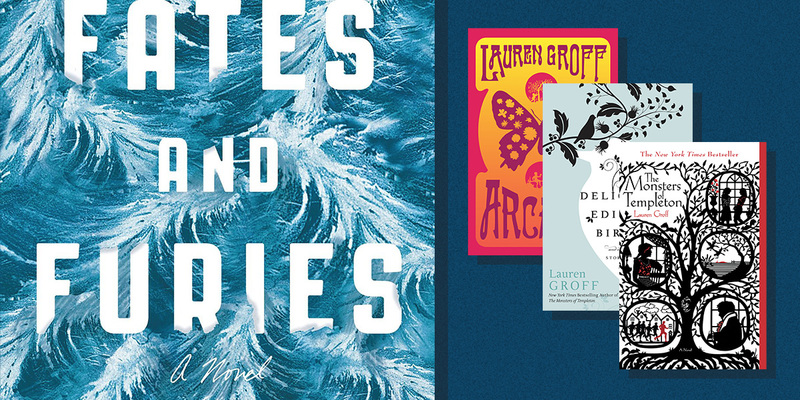 After Fates and Furies came out, one of the top auto-fills on Google after you type in “Lauren Groff” is “Lauren Groff husband.” Do you think many readers think the marriage in your book is a reflection of your own marriage? I play with reader expectation about what is autobiographical in my fiction because I am hyperaware of it always. But at the same time it does become overwhelming when there are, let’s just say, readers who are not highly skilled in reading and they yell at me as if I have done the things that my characters have done. In my first book, (The Monsters of Templeton) there is a pregnancy where the person who is pregnant does not know who impregnated her. And I went on tour and I was pregnant, and the very first question I got was, “Do you know who the father of your child is?” And I found that an egregiously idiotic way to handle the idea of what fiction is, right? I mean as long as you’re not overtly writing autobiography — well no, no, even if you’re overtly writing autobiographical fiction there is a convention that the reader and the writer both agree to, which is to not conflate the writer with the character. It’s a convention in fiction. And if one ignores that convention, it’s more a sign that the reader has not read a lot of fiction. Do you think it’s just bad readers conflating fact and fiction or do you think there’s something more there? Yeah, there is definitely something more there and I think that we’re in this place right now, and it’s really exciting to watch, of a kind of radical transparency; but also, at the same time, those people are pretending while posting selfies, which should be a hundred percent nonfiction right? They’re constructing this narrative, which may or may not be truthful. So within the framework of the autobiography they are creating fiction. And I think that’s really thrilling that people are creating art within their lives in a way that has never been seen before by the masses. So I think that people have gotten confused. I think possibly the internet has blurred a lot of the lines, which, before the internet, were really, really stark and defined. In Fates and Furies, Mathilde is portrayed in Part One as a Véra Nabokov character; she’s just happy to assist her talented husband. Is the point of Part Two then to say that one-sided power dynamics in relationships never end well — or is there something more complicated there? I think it was more intricate than that. And it’s so funny that you mentioned Véra Nabokov because she was exactly the person that I think of as Mathilde. I honestly, honestly love Nabokov. I think Speak, Memory is one of the best books ever written. But I am most interested by Véra. She is the most interesting figure in that marriage to me because Nabokov is so grandiose and he’s so arrogant. And plus he’s a genius, right? But she is amazing. She burned her own letters to Nabokov. And of course her letters are not very in-depth, but she is an incredible person to me in this marriage. And she gave up so much to be with him. From the beginning I think Mathilde was possibly in the first part what one would’ve thought of Véra, had one just met her. In the second part, I’m saying human beings are immensely rich and complicated. And even when we think we know the story, we don’t know the story. And even the people who are most self-effacing have millions of books within them. You can write a million books about Véra Nabokov and never reach the end of her because she is a complicated, flawed, interesting human being. The main criticism you got from a major publication was from James Wood at The New Yorker. His argument was that you were trying to write a realist text and took it too far in part two; it became fantasy and broke the conventions of the realist novel. How do you respond to that critique? I haven’t read the James Wood piece yet. I will some day. But the book is still too tender to me to do it. But because of other people, I have gleaned what he said. Honestly, I wasn’t trying to write a straightforward, realistic piece of text. Just one hundred percent not at all my intention. That wasn’t the book that I wrote. And it wasn’t more fantastical, but it was written in not-straightforward realism. It was written using a different toolbox, I think. And of course he would prefer the first half because I used every single narrative trope — historically masculine trope — that I could, right? I mean he is a magnificent critic, but he really, really, really enjoys standard narrative writing. So I was not at all surprised to hear this. From what I’ve gleaned, I completely disagree with it; but, honestly, James Wood read my book! I’m shocked. I can’t feel bad about anything. Well that’s just it. You’re a big deal now. How do you deal with this newfound fame? I am not a big deal. I am not. No, I’m a person, and I know this because I struggle every single day with this new work and I’m trying to figure out how to do it. I’m a working writer. And I think working writers never, ever feel like a big deal. And I know for a fact that I’m not, because I’m still as confused and angsty and nervous about my work as I’ve ever been. I could have told you I had more confidence when I was eighteen years old and that would’ve been absolutely true. The deeper I get into this life of writing and making things, the more I understand that I don’t know. I live in Florida, I never see other writers. I have some really good friends who are writers but we hardly ever see each other and it’s basically email conversations. So my conversation is with the book that I’m reading and my own ideas about the work that I’m doing and it’s a very quiet, a very external sense of what literature is. And I am so, so, so grateful for people having read my book and Obama and being on Charlie Rose — that was a dream that I have always had. But it’s not me. I’m just confused, frankly. Do you have writers with whom you share your work or with whom you talk? Yeah. I have a number from grad school who are really, really amazing, wonderful. And my friend Laura van den Berg reads a lot of work my work and Elliott Holt reads a lot of my work and Jami Attenberg reads a lot of my work. So it’s basically people that I’ve met somewhat randomly through festivals and residencies and who are just — you know when you meet someone if they’re automatically a friend? They were automatically friends. Have you had a moment where you really connected with a fellow writer and you understood their work and they understood your work to a significant degree? I do but it’s so funny; for me the human being steps in front of the work in a certain way, and I feel like my closest communion with the work is with the work. Actually, the person obfuscates in a certain way what is really, really interesting about the work itself, but it should stand alone in a lot of ways. I feel like that every single time I sit down and read a book and am blown away. I just re-read Roberto Calasso’s The Marriage of Cadmus and Harmony. It is the best book I’ve ever read. And I say that four times a year with four different books but this one, oh my God, it’s so phenomenal and it’s just a work of absolute genius. I love the brain that made this. I feel like I truly understood the frame and the frame was fascinating; I could sit in thrall to it for the rest of my life if I could, except I think he’s only written a few more books so I can’t. But you know how it is: it’s almost as if a book is the external manifestation of a human being’s mind that you get to live with in an incorporeal way. It’s just so astonishing and wonderful and moving and beautiful that we get to do this as human beings. So yes, I feel like I do have a communion with other writers, but it is generally alone with the book and not necessarily with the person, which is a different issue all together. I do too. He was saying that as a fiction writer his biggest goal is to connect — that was the word he used, connect. Would you agree? Do you have a different word — or is it about connection for you too? That’s sort of the goal, right? I mean it’s to make people feel better about their existence, right? I think that’s the ultimate thing that you could do in life. And we get this one extraordinary tool of writing to make people happier. Or maybe even not happier but make people feel the magic of being alive, which is so easy to overlook. I am a hundred percent on board with what Jess says. Is that something you always knew though, or is that something you came to embrace later on? Well I’m such a shy person, like inherently shy. I don’t think I talked to anyone outside of my family until I was in third grade. So my very first major connection to other people that weren’t in my immediate family was through books. So that was so meaningful to me, and I only wanted to do that for other people if I possibly could. If there was anything that I could do with my life, that’s what I wanted to do. Is it hard having a wildly successful novel as far as the expectations for the next novel? Or is it freeing in a way because you know a lot of people are going to read it? It’s neither. Because I try really hard not to do the same thing. And my next book will not look like my previous books. So whatever this next book does is what it’s meant to do. And I’ve come to terms with the idea that my book is so, so different that not everyone is going to like every book. And there’s a part of me that’s really sad about this because you do want to connect all the time and then there’s a part of me that thinks that’s okay, perhaps they’ll be moved by one and not the next one and then maybe if they give me another chance on another one down the line too. I’m in this for the long run. And as long as I feel like I’m trying to speak as much truth as I possibly can, and people are willing to publish this and I do the best job I possibly can, then that’s all I can really worry about. Is there anything you’d like to say about writing the book, yourself, your career?